Artist’s conception of new development at Spirit Square. The Tranquille Road shopping corridor will get two new commercial buildings as part of a development adjacent to Spirit Square. 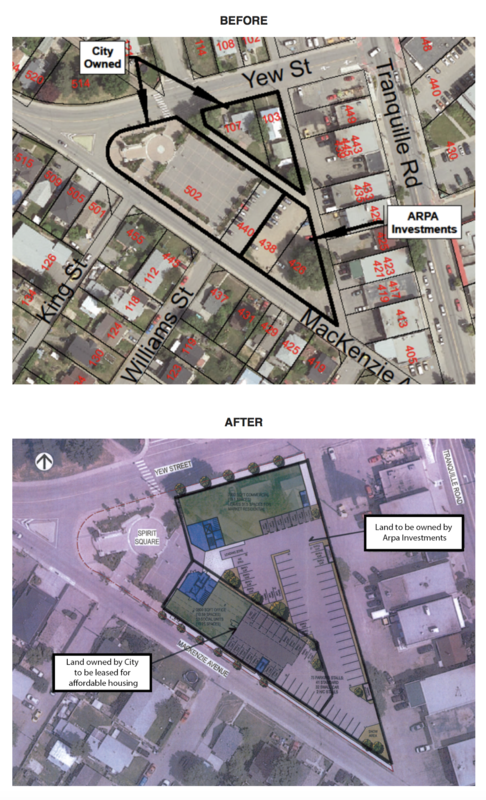 Details of the plan were announced today by Arpa Investments, which will swap land with the City of Kamloops to make it happen. Along with the Spirit Square land deal, the property located at 577 and 591 Royal Avenue, commonly referred to as the Thrupp Manor site, is proposed to be rezoned and subdivided to accommodate five single-family residential lots. That parcel was initially identified for an affordable housing opportunity, but was later determined to be unsuitable for the density of the proposed project. “We truly believe in the potential of the area,” said Joshua Knaak, a partner in Arpa Investments. “We worked in consultation with the community with the Friends of McDonald Park Association, North Shore Central, the NSBIA, and business owners. He said one of the key factors was that residents wanted a community oriented development that maximized the potential use of Spirit Square. Two mixed use buildings centering on Spirit Square. One building to feature 7,000 square feet of restaurant/commercial space with approximately 33 market units. One building to feature 5,200 square feet of commercial/office space with 43 affordable rental units for seniors, owned and operated by ASK Wellness Society. About 75 surface parking stalls. An open house will be held at Red Beard Roasters on Sunday, Feb. 25 from 5:30 to 7:30 p.m. to explain more about the development.